Sleep with your iPhone? Now you can make it cuddly. Oh Kickstarter, thank you very much for making this possible. 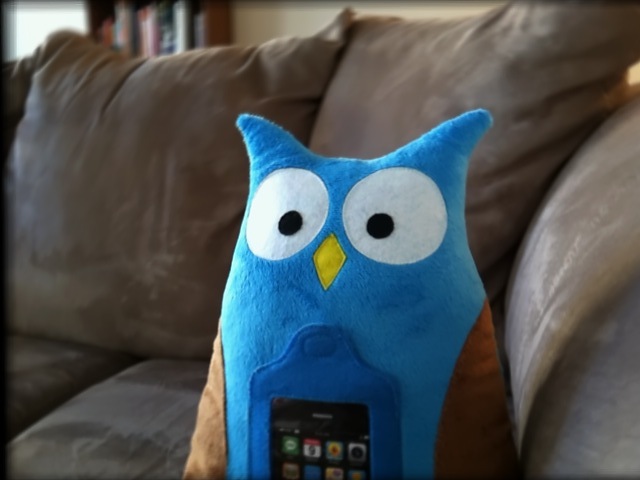 That thing you see in the image above is “the first mobile plush for iPhone and iPod touch.” It’s a stuffed owl called Swoop (because why not? ), and you put your iPhone (s aapl) or iPod touch in a transparent and touch-friendly pouch in its gut, thus making it much more enjoyable to hug and cuddle your Apple mobile device. The Swoop project is said to be “great for kids” on the product’s official website, but it might appeal to adults, too, since apparently a whole lot of us sleep with our devices anyway. This just means you can keep it even closer, and in fact even rest your face against it so that you never have to worry about missing a late-night email again. Swoop isn’t a reality just yet. The project’s creators still have a ways to go before they meet their modest $7,500 goal. A $25 pledge on Kickstarter qualifies as a pre-order, so if you feel like the only thing your iPhone is missing is slightly softer edges, this might be the project for you. 75% of iphone users sleep with their phones??? In bed with them??? I knew that the iphone was at the center of our addiction to constant, sensory input, but if this is really true, I’m scared. When we spend so much of our lives living in the mind, we neglect our emotional and energetic bodies. I hope this study is way off. I’ve struggled with the impulse to keep picking up my iphone and playing with it. I keep it connected to the computer at night. have you guys heard about the risk from mobile phone radiation – especially for kids !? sleep with your phone are you crazy??? That’s during phone calls. It’s the antenna which causes that, and only when active. Having an idle phone next to you is no more likely to give you cancer than sleeping with a stuffed animal. I’d like to point out that this isn’t the first product in this space. I’d like to also request that the story be updated. I’ve bought a Griffin Woogie for my kids so that they can use their iPod Touch 4th Gen and FaceTime me. I don’t use the built-in battery powered speakers. FaceTime works fine with phone inside, mics. pick up audio fine. PS – I have NO relation to Griffin, Apple, etc.. Just a Father who is a geek. Have you thought how such a toy might be helpful for reaching autistic or traumatized children or kids in hospital? Some of us who have on-call responsibilities are required to be awoken in the wee hours of the morning by pages and phone calls. To keep from waking my spouse I sleep with my iPhone under my Pillow so this could be a viable alternative. I do worry about the iPhone slipping out and falling to the floor…if this would prevent that then it might be worth 25$….